Pour eggbeaters in another bowl, next to the mixed breadcrumb ingredients. Coat chicken breast in egg beater, letting excess egg drip off. Put egg covered chicken in gluten free breadcrumb mixture and coat thoroughly. Prepare skillet/pan by wrapping tin foil around handle and heat stovetop. Place gluten free breadcrumb coated chicken on skillet and cook on medium heat, about 6 minutes each side or until brown. Once both sides are brown, place entire pan in oven. Cook for about 10 minutes or until done. Serve on plate, topped with Italian tomato sauce and whatever sides you like! I prefer spaghetti squash and a side of broccoli. Some other ideas are to serve over zucchini ribbons,gluten free pasta, any vegetables, or even enjoy as a sandwich on gluten free bread! Get Creative! 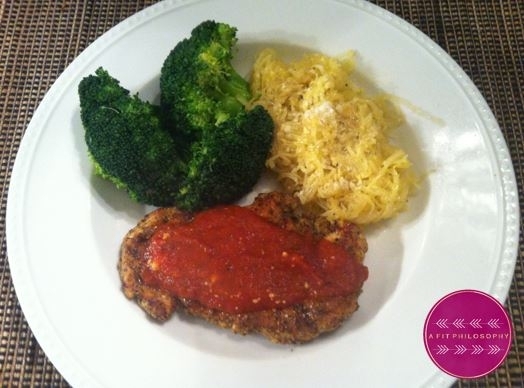 (If I was on point with my diet the entire week, I top with a little parmesan cheese as well, hence the name of the recipe..."Chicken Parmesan").